– Dark Horse kicks off their Conan comics with an issue 0 by Kurt Busiek and Cary Nord. Busiek and company went back to much of the source material for their stories, and the Conan character has been with Dark Horse ever since. – With issue 28, Brian Michael Bendis and Michael Gaydos close out the Alias comic featuring Jessica Jones. This title would then spin off into the Pulse. I seriously need to read this someday. 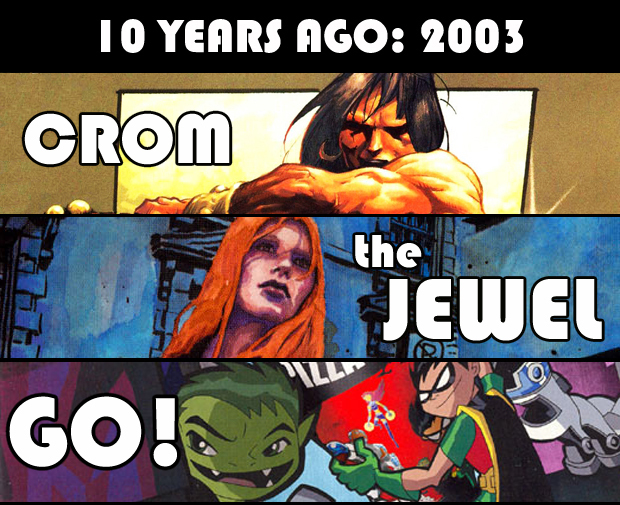 – As I went through the anniversaries, I couldn’t believe that the Teen Titans cartoon was now ten years old! Wow. Months after the cartoon debut, DC released Teen Titans Go! #1 as a compliment to the TV show. – Some sources put the first issue release of Sandman in November. The ad states November as well. Other resources list its release in October. Since my own personal records aren’t any help on this one I’ll just go with November since I already did the October Timeline post. Like Preacher and Walking Dead (and the original Thunderbolts volume and Starman and probably so many other great comic runs), I saw the first issue of Sandman on the shelf but didn’t purchase it. Flipping through it I probably thought the artwork was a bit “crude” – I wasn’t a stranger to non-mainstream art at the time (heck, Bill Sienkiewicz on New Mutants was a huge slap to my mainstream art expectations) – it just wasn’t something that grabbed me. I believe I started collecting the single issues at the start of the Kindly Ones storyline, and then eventually got everything in one of the many hardcover formats released over the years. I need to do a reread of this entire series, mostly because I know I haven’t read every issue and/or spin-off. I still haven’t picked up Sandman Overture 1 either – I mean seriously, you know DC is going to do its best to collect it eventually in a shiny package. So I might as well wait. Or I’ll find it at a con and pick it up for $1. Because I’m weak like that. – With West Coast Avengers 42, John Byrne takes over writing and art (for a few issues) and kicks off his controversial Vision Quest storyline. 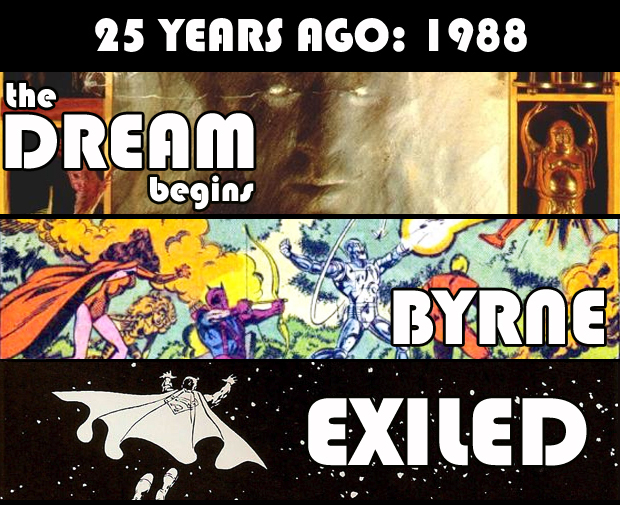 I used to pick up any title that Byrne jumped on but 1988 was when I dropped comics for a few years so I missed this story. I’ve always meant to go back and read it (along with his short Hulk run and his Namor stuff). – After the events of Invasion! and because of his own personal inner demons, Superman decides to head out into space on a self-exile. Adventures of Superman #450 is the start of the story that would introduce the Eradicator, reveal more about Krypton’s history, send Lex Luthor on a hostile takeover, bring George Perez to the character as artist and writer and more. 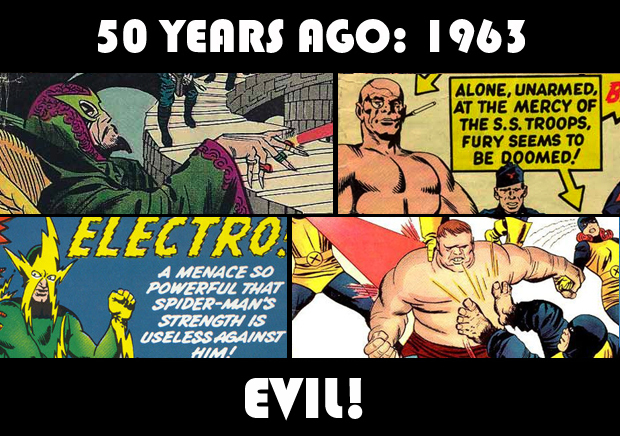 – At least four Marvel villains made their debut in November 1963: Mandarin (Tales of Suspense #50), Baron Strucker (Sgt. Fury and His Howling Commandos #5), Electro (Amazing Spider-Man #9), and the Blob (X-Men #3). Kudos to the Mandarin for keeping up the Marvel villain tradition of sporting green and purple!